The first antique soda bottles held fascinating, carbonated, fruit flavored drinks with unusual names like Neophyte Julep. In the early 1800s Townsend Speakman of Philadelphia sold his Neophyte Julep carbonated drinks in unmarked containers to Dr. Philip Physick for medicinal purposes. The doctor then sold them to his patients for a cost of $1.50 a month for a daily glass of the fruit flavored drink. 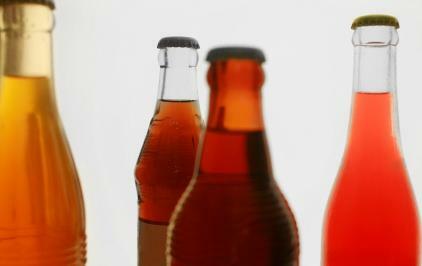 The carbonated beverages of the times remained in unmarked bottles in the United States for several decades. In England, during the same time period, a bottle called the torpedo shape bottle (circa 1800-1900), made of stoneware, was being used for carbonated waters. The shape of the bottle, believed to have been invented by Nicholas Paul a partner of Jacob Schweppe, resembled an egg with a round base. It is believed it was modeled after the bottles used in the 1700s to hold the German spa waters. The rounded bottle bottoms meant the bottle always laid on its side keeping the cork wet. If the cork had been allowed to dry out, the shrinkage would have let the gases escape from the bottle. In the late 1830s, a Frenchman living in the United States named Eugene Roussel, perfected and introduced the first soda waters flavored with prepared syrups instead of flavoring them with fruit juices. Roussel 's drinks quickly became very popular and the Dyottville Glass Works reopened outside of Philadelphia to make bottles for Roussel. The bottles, made of glass were early pontil shaped and was used from approximately 1838 to 1845. As the popularity of the soda spread more soda manufacturers and glass factories opened to produce bottles for the growing industry. To set his soda bottles apart from his competitors, John Roussel changed the style and color of his bottles so that it was easily recognizable by the public. The carbonated beverage was now being sold in cobalt blue glass bottles shaped in what is known as the soda shape which was used from approximately 1845 to 1865. It was not long before John Roussel's competitors also changed the color and shape of their soda bottles. One of the most popular types of soda, Coca- Cola, is also one of the most collected brands of soda bottles and soda related memorabilia.